The outer edges are decorated with scallops, jewels and winged seraphim. The clasp symbolizes God’s mercy, His connection to the world and eternity. 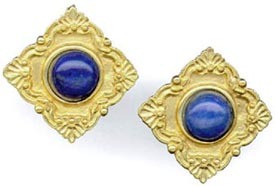 Gold plated with lapis. Inspired by the art treasures of the Vatican Museums.